Workers Enter Japanese Reactor Building For First Time Since Disaster : The Two-Way Working two at a time for 10 minute shifts because of the "high levels of radioactive substances," the team members will first install an air purifier. Later, they will install a new system to circulate cooling water within the reactor. "A team of workers has entered the Reactor Number One building at the Fukushima Dai-ichi nuclear power plant for the first time since the hydrogen explosion the day after the March 11th earthquake and tsunami," NHK reports. 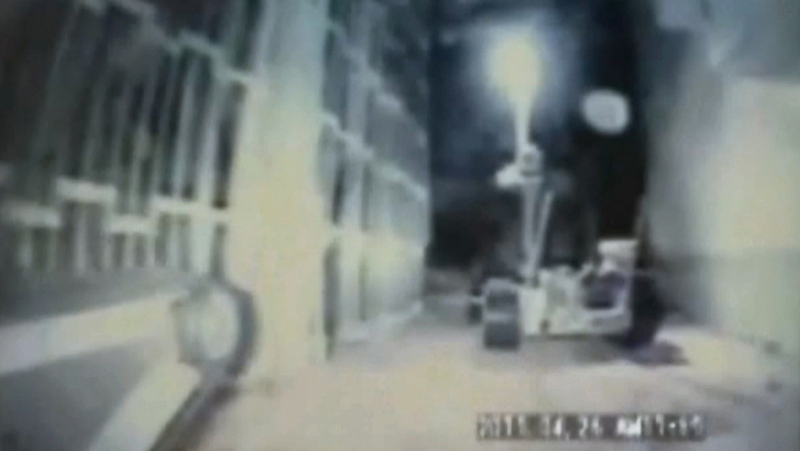 April 29: An image from video taken by Tokyo Electric Power Co. as robots explored the nuclear reactor building of Unit 1 at the Fukushima Dai-Ichi plant. Working two at a time for 10 minute shifts because of the "high levels of radioactive substances" in the building, the team members will first install an air purifier. It's hoped that after a few days, work can begin on installing a new system to circulate cooling water within the reactor, NHK says. As Kyodo News writes, installing the air purifier "is aimed at preventing workers from suffering internal radiation exposure when they work on setting up a new cooling system at the No. 1 reactor." "Radiation leaking from the Fukushima plant has forced 80,000 people living within a 12-mile radius to leave their homes," The Associated Press adds. "Many are living in gymnasiums and community centers." As of today, according to Japan's National Police Agency, 14,817 people were confirmed to have been killed by the March 11 earthquake and the tsunami that followed. Another 10,171 are still missing and 5,279 are known to have been injured.